The Preston County Sports Museum presents the Smithsonian Hometown Teams Traveling Exhibit in Rowlesburg, West Virginia May 11-June 21, 2014. Rowlesburg is the third WV town that will host the latest and newest National Heritage Traveling Exhibit. The exhibit emphasis is placed on the “Spirit of the Game” in rural America and is co-sponsored by the Smithsonian Institution and the West Virginia Humanities Council and is part of MOMS, Museums on Main Street USA. 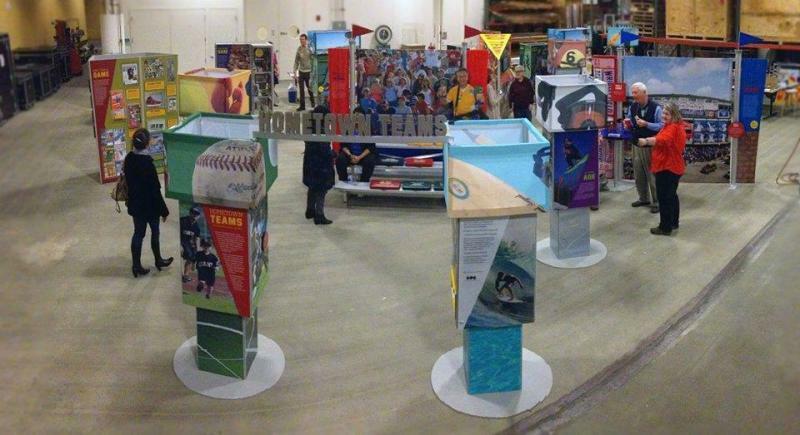 The Hometown Teams Exhibit will be on display at SC/OLD RHS from 1pm to 5pm Tuesday, Thursday, Friday, Saturday (11am-5pm), Sunday 1pm to 5pm at the PCSM. The exhibit will be opened special hours for planned special school bus tours and for adult Hometown tours. The young and savvy who access sports programs by cell phone and other electronic and battery operated devices will easily appreciate the media complexity of the exhibit. The exhibit engages all the senses and is accompanied even by the smell of hotdogs with mustard and onion, popcorn and other specialty foods and captures hometown sports in photographs, audio and visual clips. Children, adults and people of all ages will love this exhibit and will get to answer trivia questions and will be able to tell their own stories. Social media used in the exhibit will capture the heart and soul of small town communities in Preston County and elsewhere. We learn in a new way from this exhibit that sports have played a role since the 19th century in developing small town character. Rowlesburg has its own professional ball player in the person of Jock Menefee who played professional baseball in several professional ball clubs in the late 19th century. The exhibit captures the gamut of emotions in the victories and losses of the game. The PCSM Companion Exhibit has a broad spectrum of authentic artifacts and displays on sports in rural Preston County and has educational and aesthetic objectives that evoke sports memories from childhood experiences. The PCSM exhibit teaches us that a good sports team unifies community spirit, creates a healthy sense of competition, builds the character of men and women, teaches participants the importance of team effort, teaches goal setting, shows the importance of drive and initiative, encourages the win-win and the never- give- up attitude and last but not least builds healthy bodies as well as healthy minds. Planned fun activities for May 11-June 21, 2014 include exchanges of stories with former Preston County famous athletes, artistic and historic movies of sports heroes on Saturdays at noon, school bus tours on Tuesdays, adult bus tours on Thursdays, special speakers, Field Day in the famous Rowlesburg Ball Park along with a special Homecoming with Buckwheat Sports Stars, and a talk on women’s sports by a WVU distinguished faculty member. PCSM, a remarkably fine first ever museum of its kind in the state and nation prepares and hosts a Companion Exhibit with a show of some eighty years of precious memorabilia of 10 original Preston County hometown teams and three consolidated teams. The PCSM Companion Exhibit housed in three adjoining spaces embodies this enthusiasm and excitement. Available in the exhibit are original sports accounts by noted sports journalists such as Mickey Furfari and Dr. Mike Teets. You may find articles on local sports as recorded in county local and state newspapers. The exhibit, important for the already generated interest in preserving sports history in the area, upon reading will create the same enthusiasm found in this spectator sports activity. Preston families in rural WV small towns have in the past, and continue to attend live sports events and frequently continue to gather around a television set or a computer screen in order to watch baseball, football, and basketball along with as many seasonal sports as possible. The Hometown Teams Exhibit will be available throughout the 7th Annual River City Festival of the Arts Memorial Day Weekend May 23, 24, 25, 26, 2014.